as one of those ladies on npr so astutely pointed out in an interview with ezra koenig, this is the last album vampire weekend will make while its members are in their twenties. everyone expresses some fear or general sense of unrest about reaching their third decade, but few incorporate as many references to mortality and death as vampire weekend. modern vampires of the city is the band’s third record since taking over the blogosphere back in the summer of 2007. throughout their self-titled album and its 2010 follow-up, contra, vampire weekend freely explored afro-pop, shameless ’80s influences, and prep-school commodities, often playing into the stigmas and stereotypes that were attached to them. in many ways, media and public perception contributed largely to the aesthetic vampire weekend attempted to create – whether they’ll admit to it or not – so while it may be surprising that modern vampires of the city is a notable departure from the band’s previous style, it shouldn’t come as a surprise that it’s so good. changes in the band’s musical direction can be traced back to contra, which saw multi-instrumentalist rostam batmanglij take over a larger share of the songwriting, along with his emergence as the band’s true lead guitarist and overall musical director. 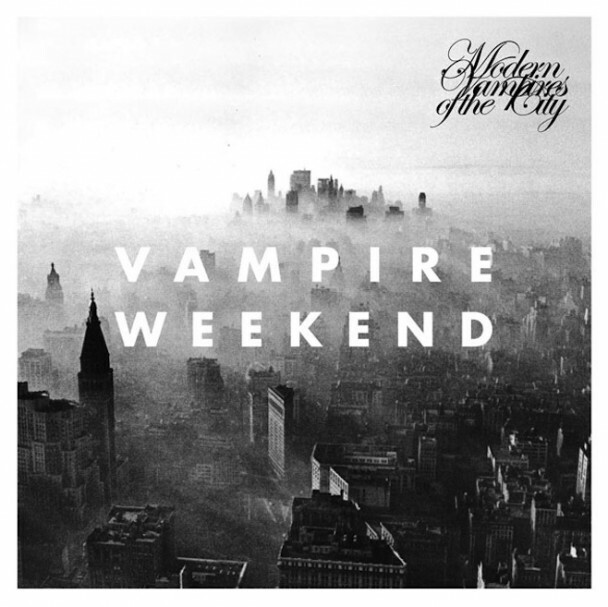 the songs on modern vampires of the city were exclusively written by koenig and batmanglij, and the latter provides nearly every instrument heard on the record, save for chris baio’s bass guitar, chris tomson’s drums, and koenig’s lead vocals. while koenig may be the face and certainly the literary component of vampire weekend, batmanglij can be credited for the new musical direction the band has been taking, and should be praised for the fact that it’s going so well. gone are the days of the simple piano riffs accompanied by reverb-washed guitar lines found on the band’s self-titled effort and referenced on contra. production is dense across modern vampires of the city and the tone is notably more serious. opening track “obvious bicycle” is a very bleak and bold way to begin an album, but within the context of the rest of the songs on the album, it winds up to be a very calculated choice. mid-tempo offerings like “unbelievers” and “everlasting arms” keep the mood light enough for the album to still be recognizable, but the true power comes from “diane young” and “ya hey”; the two songs that feel most like vampire weekend, but are a stark lyrical departure. to move away from a pigeon-holed genre is both a bold and sensible decision for a veteran band in the digital age, but a brash, brief embracement of old stylistic pillars as the backdrop for a radically different lyrical context is rare. “diane young” is a clever double-entendre and marketing ploy; the band didn’t believe it could function as a single with the more direct title “dying young,” but the message remains the same. the sense of abandonment and overall morose atmosphere of “ya hey” and “hudson” underscores koenig’s delayed quarter-life crisis. modern vampires of the city is vampire weekend’s best album to date and, according to koenig and batmanglij, is the last installment in a trilogy of records. my suggestion is to listen to the album as a stand-alone, and then to go back and listen to all three with gapless playback. i guarantee it will be a different experience.